The new official 2014 Giro d’Italia jersey designs were today unveiled during the Pitti Immagine Uomo event. This year’s Giro d’Italia takes place from 9th May – 1st June, starting from Belfast in Ireland. 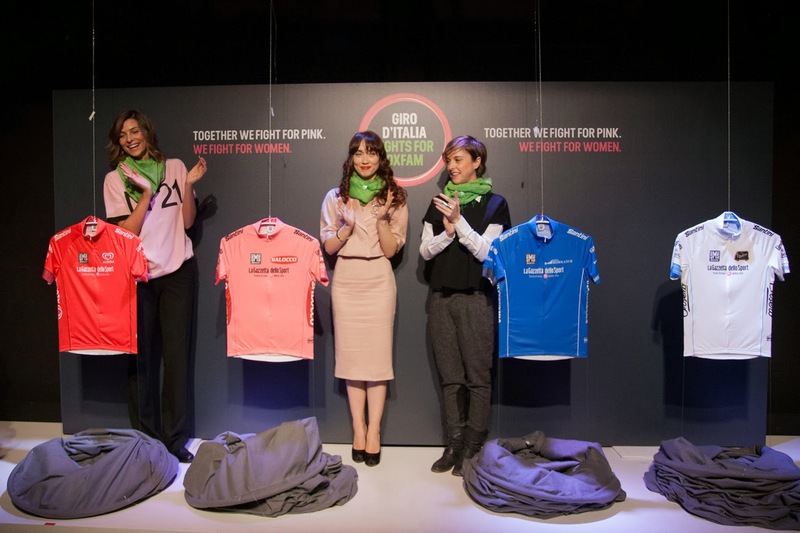 The unveiling of the 97th edition’s jerseys included testimonials from the event’s new charity partner for 2014, international charity Oxfam, with the charity’s Cristina Chiabotto, Chiara Francini and Nadia Toffa in attendance. Created by the Irish designer Fergus Niland on behalf of Santini SMS who will make them, the jerseys’ represent the perfect match between Giro d’Italia and the Grande Partenza on the island of Ireland. The jersey features typically Irish graphics, such as tweed pattern and a stylized shamrock as symbol. The charity partnership is proudly reinforced with the claim that “Giro Fights for Oxfam” on the left sleeve, to underline the charity causes that the Corsa Rosa and the Oxfam will support together. MAGLIA ROSA – BALOCCO: For the second consecutive year Balocco will be the Maglia Rosa sponsor, symbol of the General Classification leader and a cycling icon around the world. MAGLIA AZZURRA – BANCA MEDIOLANUM: The leader of this special classification, dedicated to the King of the Mountain, will wear the Maglia Azzurra Banca Mediolanum, a jersey which has the same sky colour as where the great Giro mountains stand supreme. MAGLIA ROSSA – ALGIDA: In 2014 Algida is a proud partner of the Giro d’Italia, and brings the vortex of their cream heart on the Maglia Rossa as symbol of the Points Classification. MAGLIA BIANCA – F.LLI ORSERO: This jersey represents the Youg Rider General Classification, symbolising freshness and novelty and embodying the F.lli Orsero fruit qualities. Oxfam will be the Charity Partner 2014 of the Giro d’Italia. This international charity organization is part of a great coalition, formed by 17 organizations that work in over 90 countries around the world, aiming to find permanent solutions to the injustice of poverty in the world. The Corsa Rosa stands alongside Oxfam to promote and support projects linked to rural and women’s entrepreneurship development. The pink, the colour of women, embodied in the symbol of excellence of the Giro d’Italia, the Maglia Rosa, brings a strong and clear social message that Giro Fights for Oxfam. Giro and Oxfam will together build and sustain a supporting communication campaign. btw, our friends (we have lots of them) at cycleitalia have been working on a special program for this year's Giro, see here.